To receive from your own people has a different edge to it - to know that BET recognises, I’m an African-American and an artist who has reached a certain level of excellence, this sort of sincere praise is wonderful. Where does one start when offered the opportunity to speak with a legend? 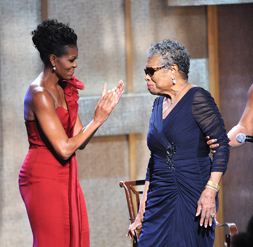 Dr Maya Angelou, 83, born Marguerite Johnson, is one of the most inspirational women of our time. 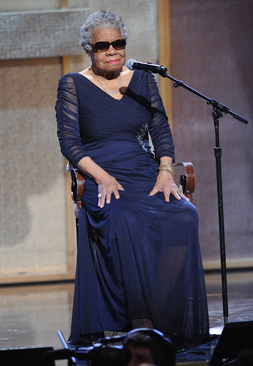 Through her poetry and literature Dr Angelou paints pictures with words more vivid than reality. She inspires and empowers, and for that reason BET Honors celebrated her accomplishments with the Literary Arts Award. The 2012 BET Honors was hosted by Gabrielle Union and the show celebrates the outstanding achievements of legends in music, literature, entertainment, media, service and education. 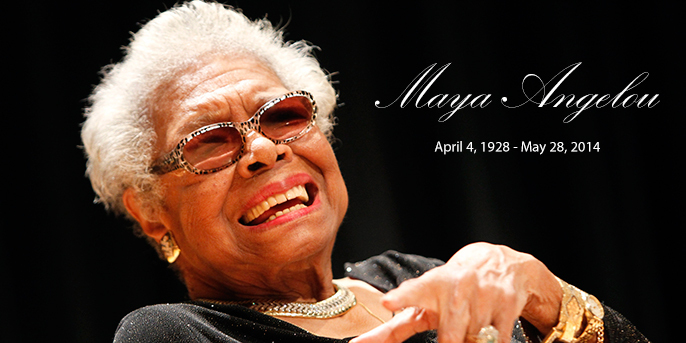 The special pays honors to renowned poet/author Maya Angelou (Literary Arts), internationally acclaimed musician Stevie Wonder (Musical Arts), Grammy-award winning songstress Mariah Carey (Entertainer), influential filmmaker Spike Lee (Media), the heroic Tuskegee Airmen (Service) and inspirational coach and mentor Beverly Kearney (Education). The show’s star-studded lineup includes performances by Aretha Franklin, Patti LaBelle, Jennifer Hudson, Kelly Rowland, Queen Latifah, Willow Smith, Jill Scott, Ledisi, Cicely Tyson, Raekwon, Common, and BET Music Matters artist Luke James with appearances and participation by First Lady of the United States Michelle Obama, Cuba Gooding Jr., Terrence Howard, Jill Scott, India.Arie and John Singleton. The show was held at the historic Warner Theatre on Saturday, January 14 in Washington, D.C. Proceeds from this year’s BET Honors private ticket sales will be given to Metro TeenAIDS. Metro TeenAIDS, a longtime partner of BET, is a community health organization dedicated to supporting young people in the fight against HIV/AIDS, through education, support, and advocacy. Thank you for taking the time to speak with me today it’s such an honour to have a conversation with you. I would like to congratulate you on your BET Honor for Literary Arts. What does this mean to you? It’s wonderful, exciting, and marvellous to get any recognition that is sincere and positive. However to receive from your own people has a different edge to it - to know that BET recognises, I’m an African-American and an artist who has reached a certain level of excellence, this sort of sincere praise is wonderful. It liberates and encourages one to go further and to do those things, better. [Laughs] Miss Jackson, I have 32 books but yes, I’m working on one just now, it’s called Mum and Me about the impact that my mum had on me. 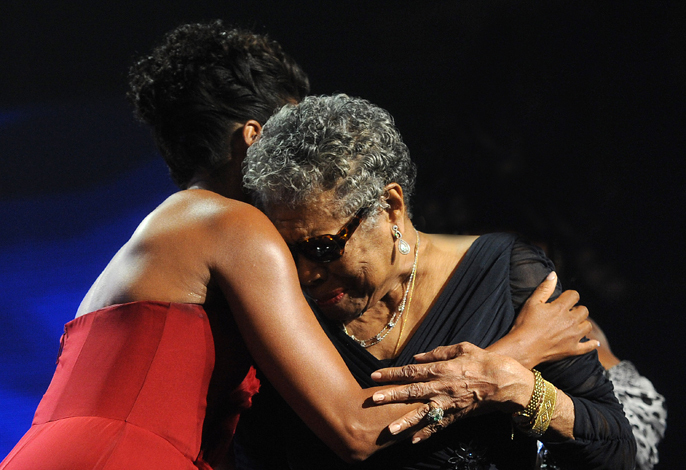 I come from a humble beginning to being Maya Angelou, my mum had such an impact on my life. I hope that mothers and fathers will see ways they can influence their offspring for the better. Your BET Honor was presented by Michelle Obama, did you ever think you would see a black president in your lifetime? No and Mrs Obama, is a grand lady and a woman with such grace. I was over the moon when I heard that she would be the person presenting the honor to me, she spent quite a few minutes saying how my work has influenced her and her husband over the last 20 years. It was a great delight. You were upset with Common’s inclusion of the ‘n’ word on the song The Dreamer on his latest album featuring an extract from your poem. How are things between you two now? Well I wish that word wasn’t there - people don’t understand how bad and negative that word is. But they will. I was never angry with Common but I was disappointed. So many people find you a source of inspiration. Who do you see when you look in the mirror? I see a woman who has been trying a long time and achieving quite a bit and I don’t know for how much longer. Do you have any regrets or wish that you had done anything differently? keep my regrets between myself and my God and try not to repeat them. Out of your many achievements what is the one thing that brings you the happiest memory? Being mother to my son, Guy Johnson and my wonderful grandson and being a great grandmother and my wonderful daughter in law - their kindness and intelligence makes me glad to who I am. I don’t have much spare time. I try to write every day. I love music and I’m trying to compose a little music. I have two cookbooks and I also love to cook. All I know is that at the end of the day I’m tired. What would you like your legacy to the world to be? I would like it to be that I was an honest, respectful and courteous Christian, which is an ongoing thing. It’s not something you achieve and then move on, it’s something you work on all day and all night and do your best to forgive yourself. Where did you find the strength to deal with some of your most painful experiences? I know that too will pass - no matter what it is I know it will pass, whether it’s good or bad. I’m grateful to know that no matter how bad the experience is; the sun does come in the morning. Finally, what are your tips on happiness and contentment?